Years after the global financial crisis of 2007, banks are still struggling to determine how they will return to pre-crisis profit margins. The combination of ultra-low interest rates, continued instability in financial markets, stricter regulation and lower-performing assets are all impacting top and bottom lines. To increase profiability, many banks are looking to expand the value proposition they offer to customers. This new value proposition is based on the banks’ ability to develop new products and services that generate alternative revenue streams by fitting seamlessly into customers’ daily lives. To deliver this value proposition, banks need to leverage big data and analytics to better understand a customer’s behavior and needs. Banks have always benefited from customer information based on account activity and segmentation. 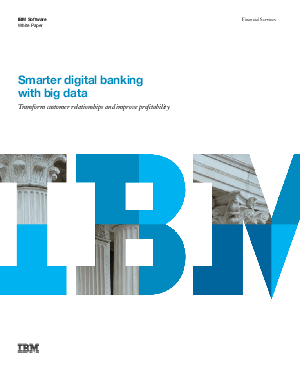 With the advent of big data technologies, banks can understand their customers in greater depth and predict their needs by analyzing all available customer information.